Bulgaria is a country blessed by a rich historical tapestry and its geographical position. To the east, it sits on the black sea, exposed to the same gorgeous coastline as Greece and Turkey, whilst the Balkans cut a swath through the west of the country. Sofia is often neglected by travellers, who instead favour the coastline and dramatic mountain landscapes. So, what is there to do in Sofia? Whilst Bulgaria’s capital does not have the grandeur of a large metropolitan city, it has its own unique story to tell. Few cities bear the marks of both Roman and Soviet occupation, after all. Spend a few days wandering the churches and museums and this developing city may just surprise you. Constructed in the 1950’s, the Largo is an assembly of Stalinist-era buildings which sit at the very heart of ancient Serdika, (Sofia’s predecessor). The three buildings were part of a Stalinist renovation scheme, to reinvigorate Sofia after the communist occupation. They represent some of the best soviet architecture to grace Eastern Europe. They served as the president’s office, the party house and the TZUM- department store. Until the end of its rule in 1990, the Bulgarian communist party occupied the party house. Today, the building is the offices of the Bulgarian parliament. To reach the Largo, simply step out of Serdika metro station and walk for a minute. 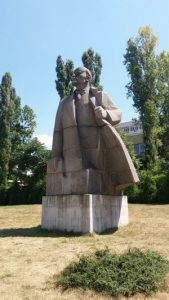 In the courtyard outside the museum, imposing statues are littered about on the grass, glorifying influential members of the communist party. Lenin gazes pensively into the distance; a replica of the red star which once sat atop the Largo has pride of place at the gate. An eerie feel pervades the place. Inside is an exhibition on socialist artwork, glorifying the Russian revolution and the countries efforts against the axis in World War II. Although slightly macabre, this place is well worth a visit for those interested in this time period. Entrance to the museum is just 6BGN for adults and 3 for students and children. To reach the museum, take the subway line heading towards Mladost and exit at G.M Dimitrov. Opening hours are between 10:00 am and 5:30 pm Tuesday to Sunday. The area around Sofia has been occupied since Neolithic times, however the first civilisation to truly leave their mark on the city were the Romans. They occupied the site and called it ‘Serdika’. The Emperor Constantine was reportedly very fond of it, labelling it ‘my Rome’. When a new metro was constructed in 2010, these ruins were uncovered. There are 8 streets, a bathhouse and a Christian basilica. A trip through the Serdika II metro station is complemented by exhibits placed strategically in glass cases throughout the walkways, such as Roman pottery. Taking the escalator down from street level reveals the apse of the basilica, which has been skilfully incorporated into the metro station. Being in a public space, all of these exhibitions are free to view. The undisputed poster boy of Sofia. 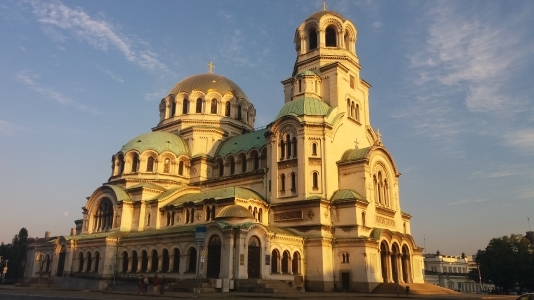 Constructed between 1882- 1912, this Orthodox cathedral honours the Russian soldiers who perished in the conflict between Russia and Turkey, fought over Bulgaria’s independence. Its many domes are typical of the neo-Byzantine style which was at the time prolific in Russia. The green and golden domes make for a transfixing site, especially just before sunset, as they catch the dying rays. Inside the capacious structure, faded frescoes and mosaics stretch all the way up to the ceiling. Entrance is completely free and the cathedral has a capacity of 5000 people, those visiting can catch part of an Orthodox church service if they so wish. To reach the cathedral from the central bus station, take the number 2 subway to Serdika and then change to the number one line and go to Sofia university. Once there, the cathedral is a five minute walk away.